If you've been following us on Instagram or Facebook, then you know that this post has been a LONG time coming. 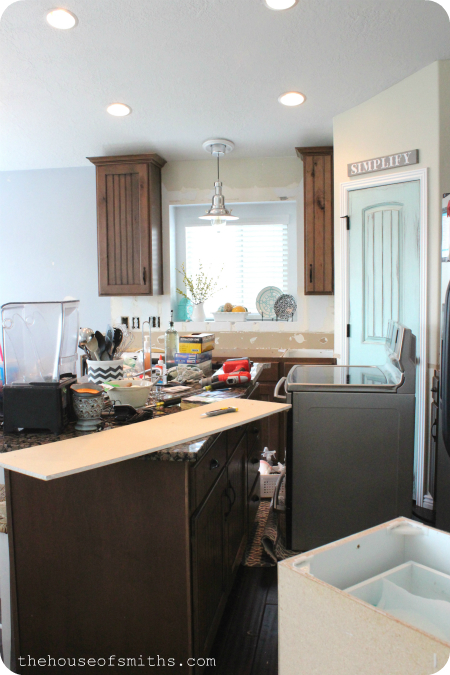 I'm trying to get better about updating as we make progress on projects around here, and because there is SO much to share, I thought I'd sum up all that has gone on during our kitchen re-style so far, in a couple of different posts. Ready for part one?... Good. Once upon a time there was a kitchen. Nothing was really wrong with it, but no matter how many decor changes or paint colors were used on the walls in the space, some of the larger fixtures were still just all wrong for this crazy couple. One night after work, the husband thought, "I think it's time for a tile backsplash around these parts." 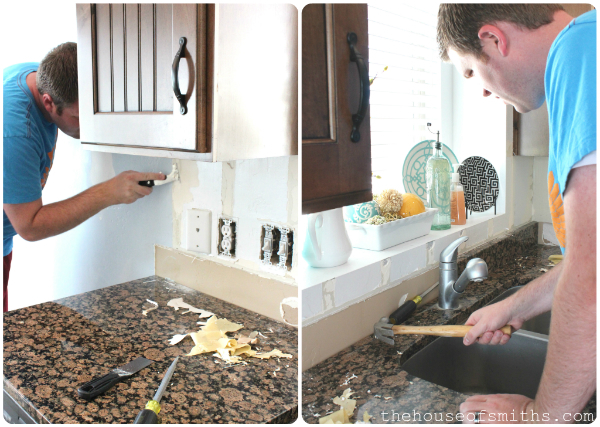 So he started ripping down their existing backsplash, with no thought for an exit strategy or discussion with his dear wife. The wife screamed "WAIT! Let's talk about this for a second." He continued demo; she grabbed her camera... the husband calls for little helpers with picky, tiny fingers to do the dirty work. After only a few minutes, the husband gives his wife THE look. The wife resists saying 'I told you so' and hides behind her camera. The next day the couple went shopping for new gray 2x4 backsplash tile at the big box stores, with no luck. So they visited their trusty counter top/kitchen makeover specialist Doug, over at Granite City. After a LOT of talking the husband decides that in order to get his wife's "dream kitchen", new granite was going to have to happen. Wife apologizes, but then reminds the husband that he started it. After MUCH searching and sleepless nights the couple finally decides that they have found a winner for their new tile backsplash and granite counter top color. A very light version of Giallo Ornamental for the granite, and Dessert Gray in a matte finish for the 2x4 backsplash subway tiles. Once everything is purchased and scheduled, the REAL demo begins. 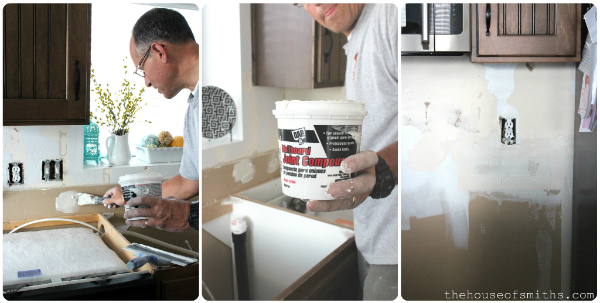 With lots of help from a Handy-Dad, the husband starts tearing things out left and right. Holes and messes are made. The wife starts to majorly stress out, knowing that the holiday season is WAY too close for all of this. She also thinks that the "simplify" sign needs to come down ASAP. Ironic much? ack! After a few deep breaths into a paper sack, the wife gets her act together and starts helping mend the damage. PS: Seeing studs through the drywall ALWAYS stresses her out. Good thing she has a great tutorial on how to fix large holes in walls. Whew! Are we super excited for all the changes that are yet to come - YES! Am I thrilled with the messes that are created with all those changes - nosomuch. And in the end are people going to think that we're totally crazy for tearing up a kitchen that was just fine to begin with, just for the sake of having the perfect look that we want for right now, in this moment? - maybe. Restyling, redecorating and taking risks is sort of our "thing". I'd like to compare it to driving a bus at full speed, with absolutely no idea of where our final destination will be... it may sound weird, but for us, it's the perfect metaphor to explain how projects get started around here. beep, beep. LET'S DO THIS! You're personality makes me laugh almost every time I read your blog!! That is so funny! I wish my guy had a bit of your guy in him. My guy is usually just afraid of change and I have to work real hard at letting him see that the change will be for the better, AND that there won't be too much work for him in it. Can't wait for the second installment. It is going to get worse first? Right? Or are you two really miracle workers and skip to the 'things are looking better' part immediately. Ah well I'll have to wait and see. 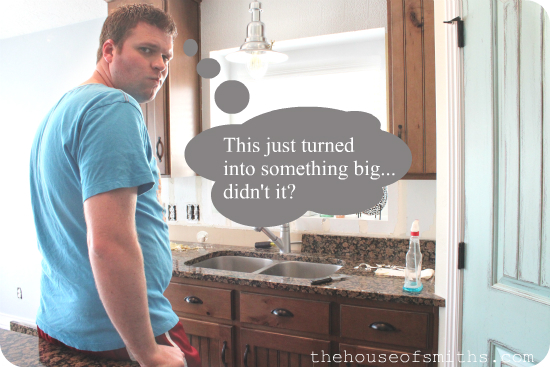 we were just out looking at countertops yesterday-thanks for the reminder of the mess it will be :) not looking forward to that but def to the end result! well, that is, if I can ever make up my mind! How exciting - I LOVE the new granite/backsplash combo! Can't wait to see the end result! I'm sure it will be beautiful! 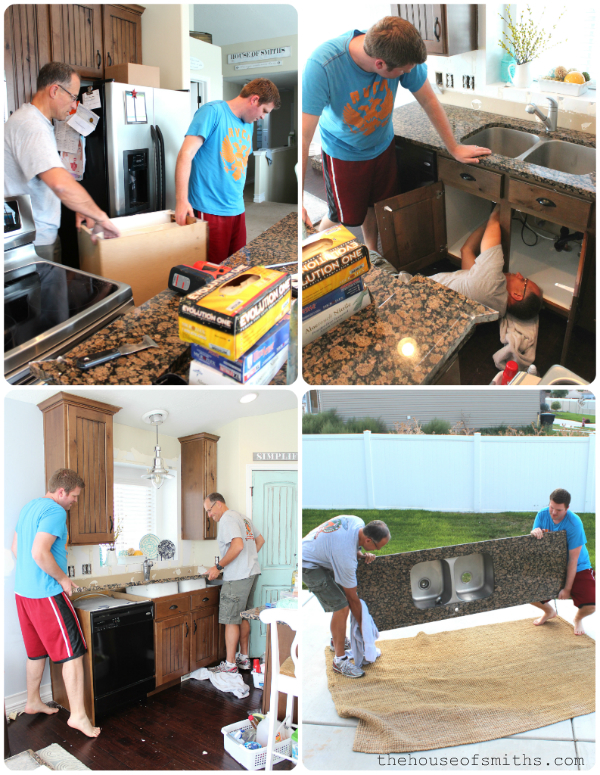 We had our marble installed ON Thanksgiving morning last year... with a houseful of family. I LOVE marble! It was out of our budget... boo! And ON Thanksgiving morning!?!? You should get an award or something. HAHA! omg it is going to be awesome - can't wait to see the finished result! oh I love it...riding the bus right along with you, can't wait to see what our next stop is! haha wow that backsplash definitely snowballed! Cant wait to see what you guys have come up with! You are too funny, and yes, that simplify sign needs to come down ASAP. And maybe check yourself into a psych ward while you are at it. Redoing a kitchen 3 months before Christmas? Ack! I have another post almost done with another update. It includes our farmhouse sink. yay! I love it!!! I would do the same,except my hubby isn't on board. He thinks our same ole boring kitchen is just fine! Maybe this winter I'll get the itch and just start tearing things out and then he'll have to be on board! Good luck! Can't wait to see the new kitchen! Wow! I wish my husband and I were gutsy and energetic enough to do what you are doing. We both would love to have our kitchen redone as it really needs it, but we won't be tackling it ourselves. And since we can't afford to pay for the work right now it will wait. I love the granite and tile choices you showed! Can't wait to see the rest of it. Good luck! I like! Thanks for sharing! Because we redid our kitchen 2 (or 3?) years ago and well, the countertop, lack of backsplash, sink, wall color, and light fixtures are allowing it from being perfection. So your blog post is giving me the courage to approach the husband to start slowly tackling these things. I mean, if we live there and spend time in there, it should be perfect, right? Right. Especially the kitchen. Love your granite and tile choice! Can't wait to see the rest..especially your new sink! Oh wow! That's going to look great!!! Are you planning on keeping the cabinets the same color? i love these choices! are you able to keep the old granite in ok shape to donate it or something, or did you have to chop it all up to remove it? so i'm not sure if you're going to repaint your cabinets, but you could you PLEASE install all this stuff and then paint your cabinets? this is purely for selfish reasons-i have and am keeping dark cabinets in my kitchen, but your backsplash and counters are totally what i want. 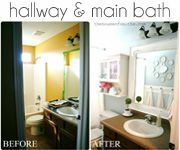 i would love to see this look instead of imagining it...but i fear you are going to go white cabinets like everybody else and i will still be stuck with not very many inspiration photos! The grey is going to be beautiful. Question please say you donated the old countertop,etc.? I can't wait to see the final product! What did you do with your old granite? Congrats on the new countertops...now I know I'm not the only crazy one out there wanting to replace perfectly good granite! I love the colors in your kitchen rug. Where did it come from? When things get tough, you can always tell your husband, you started it!! Can't wait to see the end result! 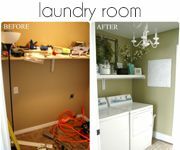 I wondered when we'd be seeing a kitchen reno, as (to me, anyways) that room didn't seem to "fit" with the rest of the style of your home - LOL at how it began though, that's fabulous! I think you both found 'your style' and it's different than what it was - or what you thought it was - years ago. Tuscan is beautiful but light and airy is energizing. 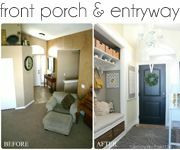 I've been following your blog for a while and I really enjoy how much effort and personality you inject, not to mention all the inspiring DIY! Thanks so much and I look forward to seeing the new kitchen - just in time for the holidays! You two are so cute and so resourceful. I love the new granite counter top and back splash. We gutted our kitchen eight years ago, so I know how unraveled things become until all is done. "Nothing great is ever achieved without much enduring;" a quote used many times from my sorority years at college. I can't WAIT to see all the changes!!! I LOVE your style and know it will make me even more jealous of your home!! haha!I hope everyone likes it! It's nerve wracking thinking that so many people will see it! eeek! Excited to see the big ta-da! Though your husband makes me nervous working in his bare feet. hehe! I always love your posts- you are very funny with your writing! I am excited to see your finished result. I put Giallo Ornamental in our kitchen and I love LOVE it- it is a gorgeous granite. You guys are hilarious!! I can't wait to see more!! Awesome!! I love the demo now, think later mode!! I struggle over home renovation stuff. I spent more time picking out my floor than I did picking out a husband. I'm glad I was impetuous 38 years ago, or else I'd have missed a great guy, 3 kids and 2 grandkids! It will be so pretty. I have a thing with gray. I can't get enough. Random question but where did you get your chevron ceramic holder for all your whisks and wooden spoons? I love it! Can't wait to see the finished product. I am sure it will be totally fab! Keep up the good work. Crazy? Maybe, but like you said re-decorating is your thing. Maybe sometimes a little more extreme, but I love what you guys do and that no project is ever to big!! Your a great inspiration & motivator because where getting ready to do our kitchen in the 4-6 months. I'll watch and learn from any mistakes that you two might make, but I doubt it, you make a great team! Can't wait to see the next chapter in the kitchen remodel. Love it! Our kitchen reno took a couple years (in my husband's spare time) and I finally have the kitchen of my dreams, I tease him that I'm the designer and he's the contractor... but it's perfect for us! I am glad to see pics after all your hints on FB. I just found your site from a pin on pinterest and am completely in love with your design style. And I have to ask, where did you get your two shelves that you have in your dining area? I have been looking for some a similar area in my home and those would be perfect! Thanks for the great ideas for decor, especially for the holidays! You and your hubby are too cute for words! You make DIY look fun! I can't wait to see more of the kitchen! Thanks for sharing. Wow how I would love to have granite. Can't imagine changing out one for another, however! Can you send the old one my way ;) Love your style. Can't wait to see the finished project. Were you able to resell your old granite? I know you could get cash for it on craigslist--then maybe you could afford your marble backsplash? Your kitchen story rings so true to me. I love going to the Parade of Homes, but after going this year and seeing some design elements that I love and can't get out of my head... I feel like even though there is nothing actually wrong with my kitchen, it is just not exactly my style. Now convincing the hubby is a whole 'nother story. lol I love the new granite and backspash you picked and can't wait to see how everything looks all put back together! You are too funny =) So excited to see everything come together. I have been dying to try Rustoleum Transformations on my kitchen cabinets, but have been too scared to start! I would LOVE a white kitchen so maybe I need to follow your lead and just jump in. I think I just found a kindred spirit... love your style and your zest for starting a project that takes on a life of it's own!!!! Wonderful blog!!! You crack me up. 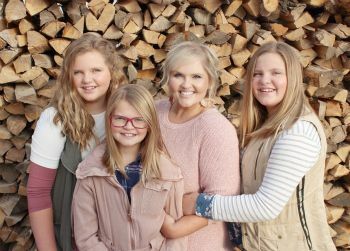 Thanks for being crazy so we can follow your blog about all the craziness. Haha! what are you doign with the old granite?? Excited to see the final product!! we painted our cabinets cherry wood brown when we moved and the next house will definitely have white! Love the new choices! Your kitchen will be so much brighter! Are you getting new cabinets too? How fun ; ) Kitchen redos frighten me, actually, my husband during kitchen redo would frighten me. He doesn't like to be displaced too long. I was wondering if you have any posts of your master bath redo. I remember you were doing some planking and countertop stuff but not sure if I missed some final posts on that. Could you help me out? I was wondering if you have any posts of your master bath project. I remember way back that you were doing some planking and some countertop stuff but don't remember seeing a final post on it. Maybe I missed it. Could you help me out? You are too funny. I also have a hard time balancing the "It's really fine the way it is" vs. the "I totally want a different look" conundrum. I'm jealous of your apron front sink, I have been wanting one for years. Best of luck! I can't wait to see how this turns out. I am sure that it is going to be an amazing re-do project that you will look back on and always smile about. Can't wait to see yours come together! Have you chosen a wall color yet? We recently got granite countertops (Light grey) and white/grey subway tile backsplash. Our cabinets are white -- we painted them a few years ago and I love them. Now here we are, four months later, and I can't decide on what color to paint the walls. But I LOVE my new countertops and backsplash! I've never had granite before. But the main reason for this rambling post is to tell you that I feel SO validated seeing your countertops and backsplash! 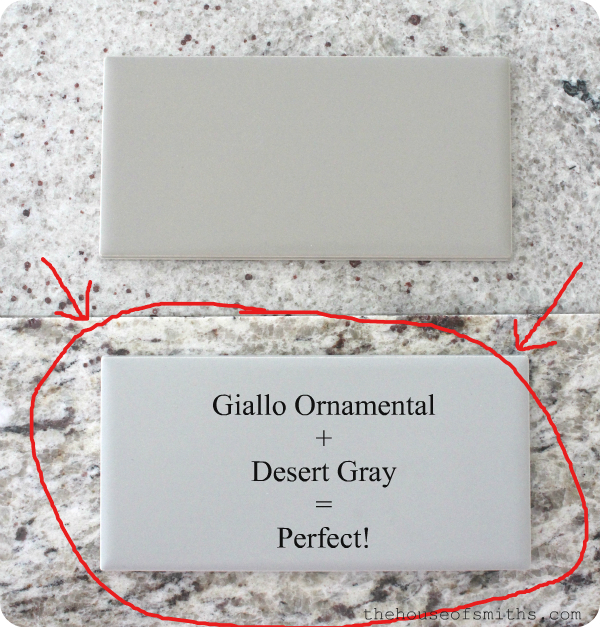 The company we worked with tried to sell me a tuscany-style backsplash with my granite. Boo! Glad I stuck to my instincts. Wish I could decide on what to do with my walls now! Thanks for all your fabulous ideas and tutorials! 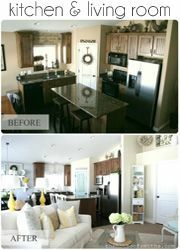 My personal style would be to paint the cabinets white with the gray granite and back splash. But you will get more contrast with the dak cabinets. I hope we get to see it soon! I know it will look beautiful no matter what you choose. You have great taste!!!! I love the kitchen door below the "Simplify" sign, how did you paint it? I love the kitchen door. What paint technique did you use for it? I SOOOO want an update to this post! How the progress moving along? Our house is so new, i'd hate to tear anything out (just give me time....!! ), but i LOVE the gray granite/tile you've chosen. I SOOO want an update to this post!! How's the progress on the kitchen?? 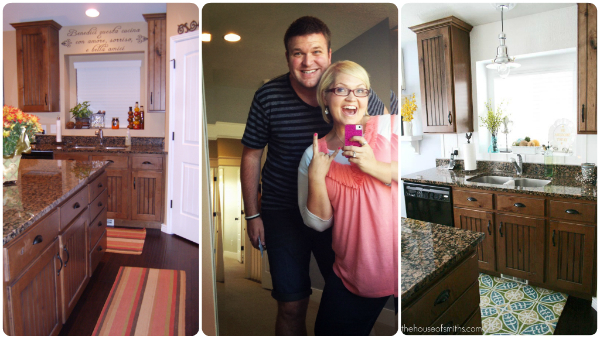 Our house is so new, I'd hate to tear anything out (just give me time, I'm already itching to paint the cabinets!) -- but I LOVE the gray granite and tile choice! So, I LOVE your green and blue geometric rugs in the picture of your old kitchen. Where did you find it?? Please don't tell me you've had it for years or something! !